Superb value for money and looking much more like one of LP's professional ranges, the Aspire Accents series provides you with a well made, superior looking starter set that includes many impressive design features and that rich, lustrous finish. Add to the obvious aesthetic value a high level of playability and a warm, articulate and cutting sound and you get a great value starter set that wouldn't look out of place on any stage. Impressive build and finish quality, decent sound and playability all with a reasonable price tag. Why hasn't LP included its pro-care shell protectors when the finish has been improved to such an extent? The EZ-Curve rims hold the natural rawhide heads firmly. The 6¾" and 8" bongo set. The Aspire Accents set comprises a 10" quinto and 11" conga set. The 9/32" tuning lugs are made from specially treated high carbon steel. LP relocated production from the US to Thailand. For more than 40 years, LP has continually raised the bar when it comes to producing hand percussion and, as the endorsement of many legendary players and working professionals proves, its popularity continues to grow. LP relocated production from the US to Thailand and, since then, has already introduced its budget Aspire series and the great value (but costlier) Matador range - both good quality instruments that look similar to some of LP's considerably more expensive professional models. The Aspire drums are aimed at players who want LP quality, but don't want to hold up their corner shop in order to afford it. Last year, LP introduced the Accents option to each of its price ranges, which gives an extended choice of finish (essentially offering the chance to have high-end finishes on entry level congas and bongos), and adds new and exciting visual options, with only a small extra outlay. There are quite a few finishes available in the Aspire Accents range, including wacky marble, tie-dyed, Checkerboard and Lava (shown here). The Aspire Accents set comprises a 10" quinto and 11" conga set in a sublime Lava wood finish (both of which stand at 28" tall), and a matching 6¾" and 8" bongo set (slightly smaller diameters than their standard 7¼" and 85/8" sizes). All the drums are stave constructed from Siam oak (like most Thai-made congas these days) and the wood is plantation grown in what LP describe as an 'ecologically sound manner'. After being kiln-dried the wooden staves are carefully glued together by craftsmen and reinforcement pins are used to further strengthen the shells. When the glue has dried, the drum is spun on a lathe while it is sanded down by hand. As most percussionists know, the forming of strong and smooth bearing edges (where the head meets the shell) is of huge significance in attaining good tone and the Aspire bearing edges are certainly smooth and tough enough. The new finish designs are in stark contrast to the rather conservative options of LP's standard Aspire series, and add an aesthetically pleasing, classy touch without being over the top. The Aspire Accents feature LP's EZ-Curve rims as opposed to the slightly more comfortable Soft Strike rims that feature on LP's mid-priced Matador series - so comparisons with the Matadors should be investigated thoroughly before making your final choice. However, the EZ-Curve rims feature a rolled interior edge that holds the natural rawhide heads skinwire- firm and even, and are comfortable enough and easy to play on. The 9/32" tuning lugs are made from specially treated high carbon steel and have precision cut threads, so they should certainly stand up to a lot of tuning adjustments - adding strength when the tunings get higher. Slightly scaled-down heart-shaped side plates help avoid you scratching the finish when you're tuning up these drums. You'll quickly discover the Aspires' deep, resonant bass and warm open tones. There is plenty of warmth and decent mid-tones and woody but cutting slaps. The resonance and melodic quality of these drums made them even more fun to play, and they had a satisfyingly full dynamic range. 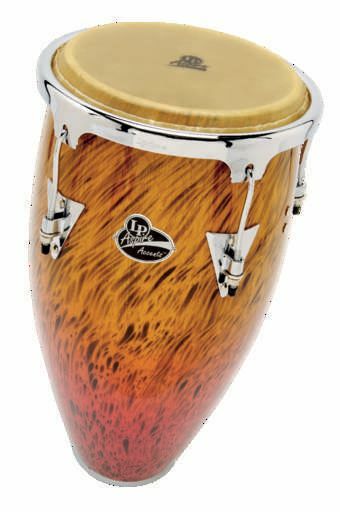 One surprise with congas with a finish as attractive as these is that LP hasn't included its beautifully simple integrated pro-care rubber shell protectors, which would keep that fabulous gloss finish dent-free. Though these protectors are available as a retro-fit option in a pack of six. The chrome of the tension plates contrasts really well with the grainy finish. LP also adds a matching chrome protective base to each drum and provides to retro-fit a set of stand brackets if you wanted to mount them off of one single stand. We think that this slightly cheapens their classy looks, so suggest playing them on the floor. If you did want to play them seated, but need more volume then employ some of LP's natty rubber conga feet, which simply slip over the bottom edge of the drums, raising them only slightly and letting the sound escape nicely. These clever little fellas would also be great if you were worried about moisture on an outside gig and, if you did want to play them standing up, then LP kindly include a pair of lightweight black basket stands as part of the package. The Aspire Accents bongo set consists of a 6¾" macho and 8" hembra. They possess a surprisingly full range of tones and were one of the more sonically cutting sets in this price range. heir reduced dimensions do produce a nicely matched sound and the macho has a pleasant and articulate cut, though both drums retain an authentic sound and feel. The bongos are also of stave construction and feature solid Cuban style steel bottoms and EZ-Curve rims with quite high-bearing edges. They are light enough to be played comfortably between your knees. Their sound contrasts well with the tumbadoras but this is always a personal thing so you should check them out and see how you get on with them before buying. That said, you would be hard pressed to find a better starter set that looks and sounds as good as these at this price. Congueros are not usually known to be shy and retiring, and LP's new Accents finishes reflect a hot Latin temperament.